I've had my '91 EX wagon since 1994 and am in the process of cleaning her up from top to bottom. I'm looking to put a roof rack on her. If anyone has any leads, I would appreciate it! I'm sure you've already been to U Pull Honda (I think its called) near Fort Lewis. Haven't been there in a long time, but it would be worth lookin into. I live further south but theres a couple places down here (Pick A Part and a foreign only junk yard called B-n-H, I believe), but those are near Olympia. Worth given em a call. Last time I went to Pick A Part I believe they had one 4th gen wagon, but no 5th gens, which is what I was lookin for. I think there is a Pick A Part in Tacoma or Seattle, unless I'm thinkin of the U Pull or whatever its called. You might try a craigslist wanted ad to, cause theres gotta be someone that would rather have a few bucks than the rack they never use. Good luck man. I will ask around to see if any buddies know where to find one locally. 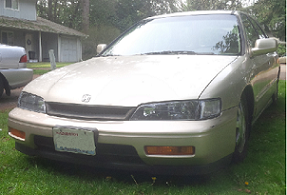 ^ I just noticed the side pic of my car in my signature is at Pick A Part in Tumwater/Olympia. Just looked it up, it looks like its called Pick-n-Pull now. Thanks so much for your reply. I will definitely give these places a call to see what might be in the yard. I located a roof rack from a '93 wagon (which I assume is compatible) from BNR using their online tool. $70 with shipping. I am new to junk yard salvaging and I am LOVING IT. Thank you so much for the hook up, man! UPDATE: BNR hosed me. After a week I called to check on my order, and the salesman told me: Oops, it looks like the part wasn't actually available. Even though he put me on hold when I made my order last week to check that the part was indeed on the vehicle. When was he going to call to let me know? Remember, I ALREADY paid. What a turkey and a complete heart break for me. Bottom line: I'm still interested in locating a roof rack. Not necessarily the cheapest, but they seem to have everything, they box it up while they are talking to you, and they are really good about taking things back. Man, really? Sorry to hear that David. I've always had good experiences with them, but it was always in person. I know they've changed ownership a couple times though. You got a full refund though, right? Yep, they refunded me, but it was a real disappointment. It was like Christmas all week for me, waiting for what I thought would be a luggage rack in the mail. Are there other chains with a big selection of cars, like B&R, which allow you to order parts off of a car? I notice that Pick n Pull does not have that option, for example. Honestly I would look for a place in Tacoma/Seattle you can check out in person. Combing junkyards online kinda takes the fun out of it.